What is Real-Time Inventory Management and Why Do You Need It? “Out of stock.” Those three little words wield the power to kill e-commerce orders faster than you can click the refresh button on your keyboard. In fact, 52% of online shoppers will abandon all items in their carts upon learning that just one item they are attempting to purchase is not in stock. And the problem doesn’t end with just one lost order: only 17% of customers return to the same e-tailer after such an experience. Ensuring you have adequate inventory is a best practice for any e-commerce retailer. The best marketing campaigns and the best user experiences mean nothing if your customer doesn’t receive the product they want, when they want it. As such, efficient inventory management can make or break the business. Keeping track of inventory in real-time is key to keeping your customers loyal and happy. As soon as an item is purchased, the product should be debited from the stock. Similarly, an item should appear in stock as soon as it is sourced and ready for shipment. Apart from accurate and instantaneous sync of stock levels with the front-end portal, real-time inventory management also extends to tracking the inventory, as it enters the stock, leaves the stock, and at all stages of its movement, until it reaches the customer. The use of unique barcodes, Radio Frequency Identification (RFID) tags, or Quick Response (QR) code enable automated systems to scan each product and make the status explicit. Real-time inventory management optimizes the supply chain, and keeps track of product movement, leading to overall efficiency in business. The business can analyze the data to schedule raw materials or goods optimally, eliminating stock-out situations as well as excessive inventory. While just-in-time inventory may not always be possible owing to practical limitations in logistics, real-time inventory management is the next best alternative, enabling organizations to right-size their inventory and attain mastery over velocity of inventory. Velocity is the measure of how quickly a product is sold after it is stocked, and an understanding of the concept enables making accurate sourcing decisions. The stakes for getting inventory right are high, considering U.S. retailers are sitting on about $1.43 in inventory for every $1 of sales. Analysis of inventory in real time highlights items that are in high demand, and also specific times of high demand, drilled down to the time of the day. Such deep analysis is invaluable for right-stocking, and also to optimize promotional campaigns. For instance, an e-tailer can gear up for seasonal spikes in demand for specific items based on analytical data collected from previous selling seasons. Real-time inventory management also helps unearth bottlenecks or trouble spots in the inventory flow by pinpointing areas where the delays occur. Such workflow optimization is a critical competitive advantage in today’s hypercompetitive business environment. Real-time inventory management plays a crucial role in customer satisfaction as well. Not only does it avoid faux pas in order processing, it provides customers with the actual disposition of their order. E-tailers can also offer transparency into accurate stock position, such as “only two items left in stock,” prompting hesitant customers to go for the purchase. One of the residual benefits of real-time inventory management is empowering businesses with actionable data and highly relevant detailed reports that help auditing, taxation, and other regulatory or quality standards compliance requirements. These detailed reports offer rich insights, such as the highest and lowest sellers, profit margins on each product, and more, enabling business managers to make more informed decisions on inventory and stocking. Key challenge towards realizing real-time inventory systems is disparate e-commerce platforms. Many e-tailers source from physical locations that are not integrated to the web. Likewise, many stakeholders in the supply chain, such as logistics providers, warehousing agents, packaging/return processing agents, and others may have disparate systems that make seamless sync impossible. Always ensure 360-degree visibility to the stock, from the time the consumer places an order to the moment it arrives at her doorstep. Opt for channel partners who facilitate such deep visibility, and are able to integrate these into your system. 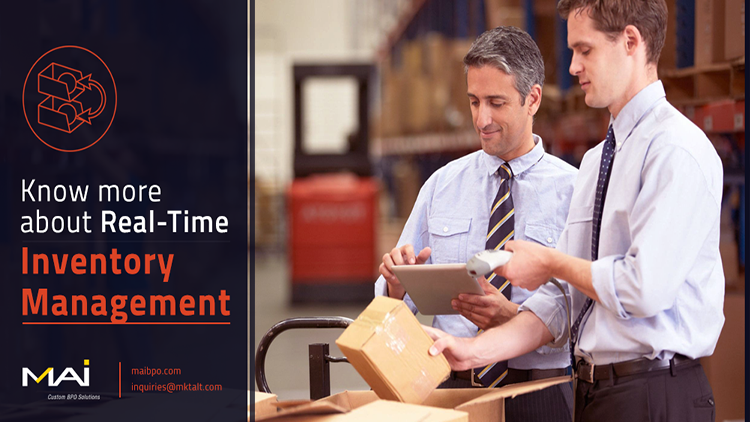 If your business has not considered real-time inventory management, there is no time like today to embrace it. The investment pays back through efficient savings, better customer satisfaction, and improved sales.